Interestingly, Kindlon looks at anger, based on the sin of wrath, and argues parents are so focused on violence that they miss opportunities to address other related issues. Kindlon claims, “The most dangerous and prevalent forms of anger in our kids are those that they keep deep inside themselves.” He maintains it manifests itself as meanness, depression, and low-self-esteem. What do kids these days have to be angry about when they have so much? According to Kindlon, “The number one concern expressed by kids was not having enough time together with their parents.” While Kindlon recognizes parents are working harder than ever to provide for their children, he encourages us to strike a balance somewhere in between “the mother who warms up her son’s mittens before he goes skiing and parents who are so preoccupied with getting and spending and advancing their careers that they neglect their kids,” as both parenting styles as problematic. Perhaps, it’s the hurried, worried child who inhabits your home. In that case, Kindlon examines drive and tries to help parents navigate the murky waters of envy. 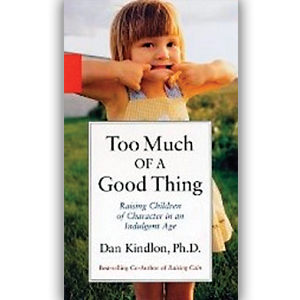 Along the same lines of Race to Nowhere, Kindlon encourages parents to ask, ‘What is it all for?’ He claims looking for role models is natural but urges parents to help their children look beyond the rich and famous. As Alvin Rosenfeld in The Overscheduled Child, Kindlon maintains, “Trying to keep up with enormously busy schedules and the demands they place on themselves takes a tool on our kids, psychologically as well as physically,” and often makes happily-ever-after that much more elusive. This is why Kindlon, like Po Bronson and Ashley Werriman in Nurture Shock, argue for the importance of sleep. He states, “According to a number of key reports, teenagers need 9.5 hours of sleep. But studies have shown that many of today’s teenagers are ending up with as little as six hours of sleep on most nights.” Therefore, Kindlon believes before parents look elsewhere for the cause of their children’s problems, they should make sure their child is getting enough sleep. While Kindlon addresses the unmotivated child, I found his take on eating problems, based on the sin of gluttony, to be most fascinating. “As a culture, we are obsessed with food, eating, not eating, and our appearance,” he contends. Parents contribute to this obsession, Kindlon claims, by failing to guide their children toward better eating habits. The scene he describes comes as no surprise: the child insisting on peanut butter and jelly, the tired parents giving in, anxious to keep their child happy during the precious time they have together. This kind of indulgence, Kindlon feels, leads to a host of problems. Whether it’s anorexia, bulimia, or obesity, eating disorders are becoming more prevalent than ever. So while, Kindlon admits, there’s no one-size-fits-all solution that can be offered up here, if we maintain a critical eye of ourselves it’ll be easier to raise children of character in this indulgent age. Still not convinced? Check out Too Much of a Good Thing. It’ll help you gain a better understanding of how sometimes love means setting limits in a world that’s full of endless choices.